One of the unfortunate effects of getting swamped by deadlines, inundated by emails and engulfed in an ever-changing pile of priorities is losing sight of “you”. In this wired world of work, you can lose track of what really works for you — the connection to yourself and what you need and want from work. 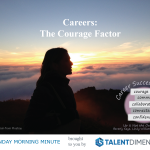 Satisfying and successful careers are more than just jobs: careers embody your unique values, skills and interests, as well as your personal traits and style. Self-awareness – or the lack of it – affects every choice and decision you make. You cannot plan your career without first knowing yourself. Having control of your career requires finding a good career fit–one that offers alignment between your personal values, interests and skills and creates a fulfilling and productive work life. The clue to achieving a career fit is to first be clear on what your interests are, which are based on a solid understanding of your current personal needs and what matters to you. When your interest and values are defined, you can safely determine the type or job you really need to reach a work/life balance. To create a productive and fulfilling work life, it is also important that the job you choose maximizes your strengths and offers the development opportunities you need to improve those not so strong skills, as well as those new skills you will need to stay abreast with changes in your field and your organization. Now that you know what it really means to be in control of your career, you will want to do something about your current job situation. Begin by sharing your values and interest with your boss and together find ways for you to meet them in your current position. If your boss does not have the means to make this happen, perhaps he/she can help you make the right connections within your organization that can help you. If you want to feel good about your job, you need to take action. Stop waiting for your ideal job to come to you. 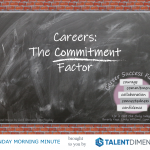 Stop saying “I wish….” or “if only I could….” and take charge of your career!